Charles is the principal of the practice, graduating in 1983 from Cambridge University. He started his career as a vet in a small mixed practice in Herefordshire, working with a poultry specialist vet. He then moved down to Cornwall, where he was able to hone his skills as a cattle and sheep vet, doing herd and flock health. After working as an OV in MAFF (now DEFRA), he specialised in meat hygiene, before setting up Beech House Veterinary Surgery in 2004, to serve the pets, farm animals and poultry of Towcester and surrounding villages. 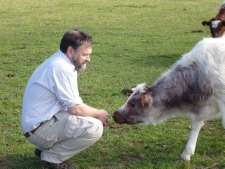 His main hobby is working on the embryo transfer project, in connection with the Rare(see links) Breed Survival Trust. Charles also enjoys gardening and sailing and looking after his flock of Light Sussex chickens. 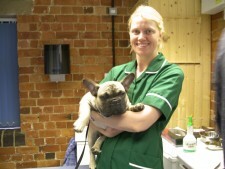 Donna has worked at Beech House Vets as our Head Nurse since the practice opened in 2004. 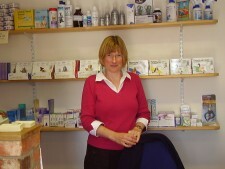 She is a very experienced nurse, having worked in small animal, mixed practice and at Davies Veterinary Specialist Referral Centre. She has also been a lecturer in small animal care at Moulton College. She is a companion animal SQP and a qualified Clinical Coach. She leads the nursing team, co-ordinating all the animal care in the practice. Here she is with one of Maureen’s French Bulldogs. Claire qualified as a Veterinary Nurse in 2002 and have worked in several mixed and small animal practices, both permanently and as a locum, before joining Beech House Vets in 2009. A short period involved working in a large referral centre. Claire is a companion animal SQP and gained the A1 Assessor award in 2006. she has enjoyed being the clinical coach for our student nurses. She is from a farming background so is used to working with animals of all sizes. She has a small holding with her husband and keeps a flock of pedigree Wiltshire Horn Sheep which she enjoys preparing for country shows and sales. Claire also has two re-homed cats and would like to keep a range of livestock in the future, plus poultry, aiming to be more self-sufficient – time and space allowing! Claire is involved in all aspects of general nursing and loves the variety of her job, but has a special interest in large animal medicine, feline behaviour and nursing and laboratory work. Claire is currently working towards the ISFM certificate in feline nursing. She first came to Beech House Vets in 2007 for work experience, staying on afterwards part-time as a kennel assistant, before beginning her Veterinary Nurse training in September 2011. Congratualtions to Natalie, who has passed all her nursing exams with flying colours and is now a qualified veterinary nurse. 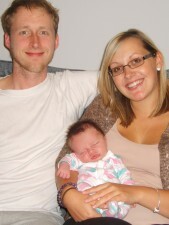 Natalie is on maternity leave and we congratulate her and Ross on the birth of their daughter, Lana. Natalie, when she returns to work, is aiming to become a Small Animal SQP (a pharmaceutical qualification). She would also like to undertake studies in feline behaviourism. Natalie currently owns two domestic cats called Frankie and Lola, but she also has experience with many other animals ranging from gerbils to chameleons. Ann works as a part-time receptionist at Beech House Vets and also as a TB Testing Administrator. As well as being an ardent animal lover, she has a natural affinity with the farming community, as she worked as a rep for BOCM in the 1980’s and travelled many a mile for them around farms in Devon and Dorset. Ann has helped to host our farmer’s meetings. She has 2 cats, Tigger and Roo and three young adults.